The time has come to move. You might be planning a quick jaunt across town or a trek through the American wilderness to a faraway city you have seen only in pictures. Maybe you need to clear out the basement to make room for your kid sister to move in for the summer, and you plan to put all your odds and ends into a self storage unit. Maybe it is business. Perhaps your boss finally gave you the go ahead to modernize the office and that self storage unit will soon be home to all the old files, mismatched chairs and old computers your boss says you cannot toss. Whatever the reason, you need a moving truck. First, determine your budget and your available manpower. Can you afford a company that will pack up your belongings and move them for you? Do you have enough stuff to justify the added cost, or could you and your friends, family, coworkers or a couple of hired hands (paid by the hour) handle the move for a much lower cost? If you opt to rent a truck and move everything yourself, you will find that many companies offer truck rentals, but which should you choose? As you compare costs, you may find one company that simply offers a better price, but be sure to include all costs in the comparison. Often the company will charge a flat fee plus a per mile fee. In addition, figure in gas costs and insurance if you need it. Check with your insurance provider to see if your auto policy covers truck rentals. If not, find out if you can add this for a lower fee than the truck rental company charges. For long moves renting a hitch and trailer may be more economical as truck rental companies often charge only a flat fee and not a per mile charge. If you choose this option, be sure to budget extra for gas. The rental company may be able to help you figure the cost of this expense. Can you rent or purchase moving aids like a dolly, boxes, tape or furniture pads at the rental facility? Compare prices to make sure the low truck rate doesn't come at the expense of high fees for other items the company requires you to use. Understand the deposit terms. Do you have limited funds available on your credit card? Some companies may accept a cash deposit while others may require a credit card. Find out if the deposit is more for different vehicles and how long it will take for the deposit to be returned to you or the charge lifted from your credit card. If putting the charge on your debit card, can you afford to have the hold on your card for that amount of time or would it be more convenient to charge the deposit to a credit card? Understand reservation terms. Know what happens if you cancel. Will you be charged a cancellation fee? Compare equipment. Can you get an automatic transmission for the size vehicle you need? Are the trucks air conditioned? Does the vehicle have a built-in ramp and how wide or high is it? Compare cab sizes. Can it fit one extra driver or two? What safety features are available like air bags, seatbelts, mirrors and visibility enhancements? Does it use diesel or unleaded? Determine the size truck you need. If you don't have much to move, maybe a van rental would work better than a truck. Sometimes the flat fee for a small truck rental is comparable to the rental price of a van, but the gas costs might be higher. On the other hand, vans do not always include ramps and, therefore, may be more difficult to load. Truck size is often based on the number of rooms you need to move. A small truck may have the square footage in the storage section to carry enough to fill a one-bedroom apartment while a large truck may move a three-bedroom house. When comparing truck rental companies, compare the square footage offered in same-sized vehicles. To save costs you may want to donate, sell or toss what you don't need. Compare vehicle suspension features. 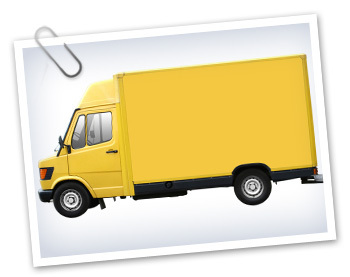 Be sure you have a driver who can comfortably maneuver a bulky moving truck in the size you rent. Trucks handle differently than cars. While you may not have much problem driving a truck across town, a long journey at highway speeds could be more difficult. Plan ahead. In some places certain times of year see a lot of people moving. Many people move in the summer. In college towns students move in and out at semester breaks, particularly in late spring and early summer. Perhaps recruitment cycles at a nearby military base or seasonal employment in a tourist town affect the availability of truck rentals during predictable times of the year. At these times, trucks may not be available or may have unusual terms like decreased rental periods for higher fees. Check with local truck providers ahead of your move to make sure you reserve you truck far enough in advance or to help you choose the best time to rent a truck. Plan your route. Find the shortest distance with the least gas-guzzling terrain. A 20-mile drive up and down a mountain may take more gas than a 30-mile trip through a valley. Remember to include fees for toll roads as you plan your route. Know what happens if your truck breaks down en route. Does the company pay for the repairs? Will you pay out-of-pocket and be reimbursed, or will the rental company pay up front? Does the company require you to use service stations? If so, will one be easy to find on the route you have planned? Will you be charged a daily fee while the truck holding your belongings is in the shop, or can you get a replacement, even if you are in a small town a thousand miles from where you started? Renting the right truck may take a little research. Get recommendations from friends, or find out if your company offers discounts when employees use a certain provider. A little planning, can make the hassle of moving much more enjoyable.